Surrey RCMP say a gold-coloured car fired shots at this vehicle early Thursday (May 7) morning. Police looking for gold-coloured car that shot at another vehicle that then crashed. 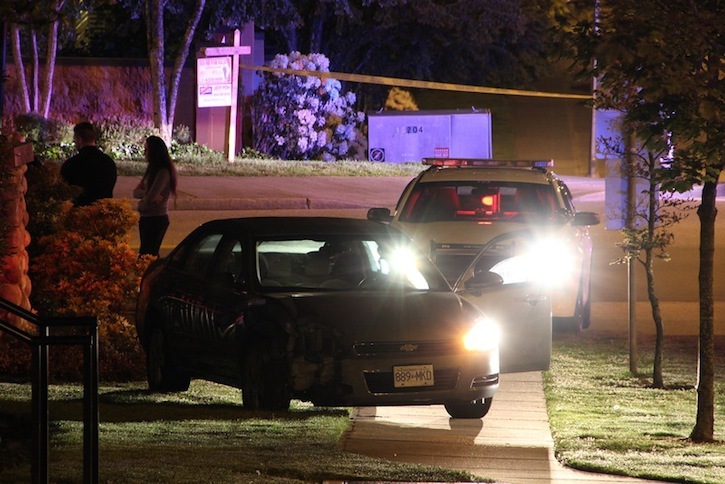 A drive-by shooting ended in a car crash early Thursday morning in Surrey. Surrey RCMP say they received several 911 calls reporting shots being fired about about 2:25 a.m. in the neighbourhood near 68 Avenue between 121 and 124 Streets. When police arrived, they recovered evidence confirming shots had been fired and a dark-coloured Chevrolet sedan had crashed into a rock post. According to Mounties, witnesses reported seeing a vehicle stopped at 124 Street and 68 Avenue, when a gold-coloured car pulled up beside it and fired shots toward it. The Chevrolet drove westbound on 68 Avenue with the gold car in pursuit. The first vehicle then lost control at 121 Street, striking a post, and the gold car again fired shots at the Chevrolet. The driver of the crashed vehicle fled on foot and the gold car sped away. No one was injured in the incident and police say the driver of the victim vehicle is a Surrey man in his 20s who is familiar to them. Surrey RCMP can’t confirm whether the Thursday morning incident is connected to a string of more than two dozen shootings – one of them fatal – that have taken place in Surrey and Delta in recent weeks. Police have said many have been linked to a low-level drug-turf dispute. Anyone with information about the most recent shooting, or who may have information on the gold-coloured car, is asked to call 604-599-0502 or Crime Stoppers at 1‑800‑222‑TIPS or www.solvecrime.ca to remain anonymous.